An antique magic lantern projector, an iPhone 6 and a live musical score shine a new light on Samuel Butler’s classic sci-fi novel. A Victorian explorer discovers a colony of refugees; time travellers from the 21st century escaping their dependence on its technology. This delightful neo-historical head-scratcher playfully welds future, past and present into a glittering bracelet of time. 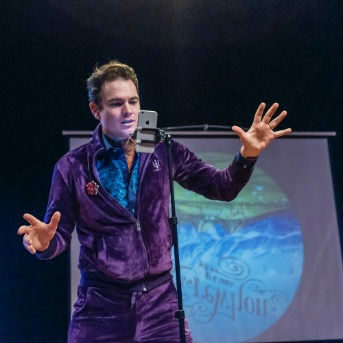 A multimedia collaboration between Edinburgh’s own Magnetic North, and Kiwi playwright and newly-qualified magic lantern showman Arthur Meek. Featuring an original musical score played live by New Zealand pop powerhouse Eva Prowse. Directed by Nicholas Bone and Geoff Pinfield.